​Eaves Karate is in its 35th year of impacting the lives of its members. While being the area's leader in Martial Arts Instruction, Eaves Karate has forged a reputation as a premier center for personal development. Within Alabama, we serve Fayette, Marion, Lamar and Pickens Counties. Eaves Karate utilizes TaeKwonDo as a vehicle to teach and reach students from all age groups. Through its Instructors, Eaves Karate not only instills the main tenets of TaeKwonDo, but of life as well. Character development begins before a new student steps onto the floor for the first time. Respect: what it is to us, our expectations and what is acceptable is communicated in a language specific to the age of the student. Courtesy, Integrity and Perseverance are cornerstones to happier, healthier, and more fulfilled living. Through interaction with our Instructors, fellow students, friends and family, these traits are consciously developed, reviewed and kept in a state of consistent progress. Through positive reinforcement, both Perseverance and a Warrior Spirit Attitude emerge as the students begin to understand their importance. These wonderful benefits of training at our facility first become apparent through the physical trials each student encounters. Eventually and individually these same traits take on corresponding mental benefits in everyday life. The ability to recognize and apply them in situations outside the school is always a hallmark of their inner success. 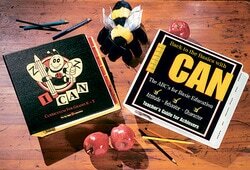 We use Zig Ziglar’s “I Can” program to help students develop the discipline necessary to power a champion-in-life mindset. In this program, our students learn the ABCs of a martial arts black belt: Attitude, Behavior and Character. In our classes, we instill the I Can lessons for a strong mind coupled with physical training in the programs below.